I went with Elisa (and her boyfriend and her mother and her aunt) to two mercadillos in search of bargain fabric for the trim on my Feria dress. Judge me if you please—I got an eyebrow raise from one friend when I told her I’d be scouring the mercadillo for my Feria accessories and fabric—but after seeing how damn cheap everything was, I have no qualms about wearing a dress that features mercadillo-bought trim instead of the expensive stuff from El Corte Inglés. Besides, I’m a guiri; no matter how hard I try, I’m going to look like a buffoon in a flamenco dress. We didn’t find the fabric we wanted in part because we were looking specifically for salmon-colored material. Salmon, it turns out, is a very objective color. Elisa thinks my version of salmon is actually pink, but her version of salmon is extremely muted… kind of brownish, like a fish that’s been sitting in the fridge weeks past its expiration date. Not the look I’m going for. But I did get lucky with one item at the mercadillo, or so I thought. 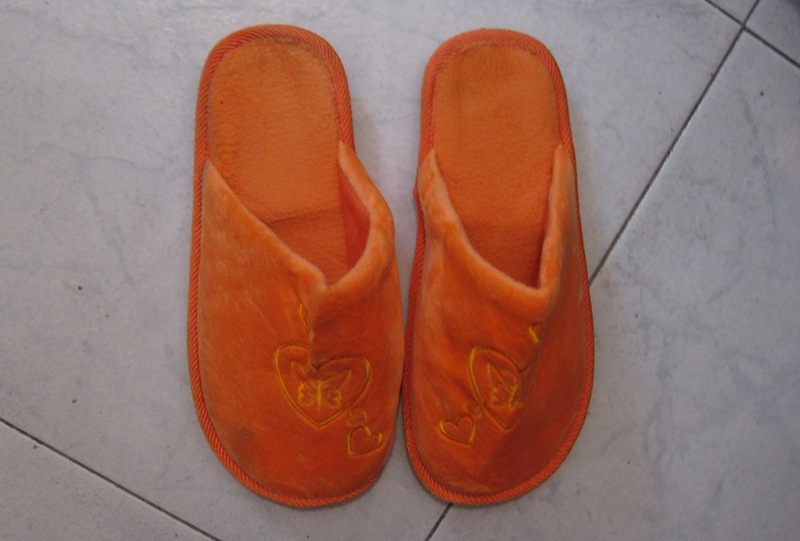 I’ve been meaning to buy new zapatillas, which are slippers or “house shoes” (if you don’t have house shoes you will catch a cold and die, according to Spain). The patron saint of the mercadillo was on my side and I found a pair of zapatillas for only 50 cents. That’s less than 1 euro, for all you truly abysmal mathematicians. “What a steal!” I thought, with an unearned sense of pride. I may have even blurted out, “Que ganga!” and taken secret joy in finally having an opportunity to use that once-worthless phrase from high school Spanish 2. The slippers are admittedly ugly. Remember Elisa’s weeks-old salmon? If you took that salmon out of the fridge and then injected it with crack cocaine, it would turn the color of my slippers. They’re a kind of neon/toxic orange. Like the color of the bombona** for the gas in my apartment; about equal in ugliness. The hideousness of the zapatillas didn’t faze me; for only 50 cents it didn’t matter. But a real problem came up when I got home and made an unfortunate discovery: These slippers stink. So far I’ve ruined two pairs of socks just from wearing them with my new slippers. The stench is that strong. But if I go barefoot, wouldn’t I just ruin my feet? I don’t know how to explain the smell; it’s some combination of ammonia, nail polish remover and death. Unfortunately, I already threw my old slippers in the trash. They had also turned slightly orange around the edges from bleach stains, so it was time. But still. I guess for 50 cents, I got what I paid for. They smell up the whole room, too, like an air freshener you could only buy at a place like Spencer’s Gfits. I came back from work today and was greeted by slipper-odor and my catmate (DOUBLE UGH). I’ll never forget that mercadillo, try as I might, considering smell is the strongest sense attached to memory (or at least I heard that it was at some point in time and have believed it ever since). *I know that a lot of gypsies make their livings as vendors at the mercadillos, but I’m hesitant to say these are “gypsy markets” because I don’t know enough about the gitano connection to accurately say much about it. 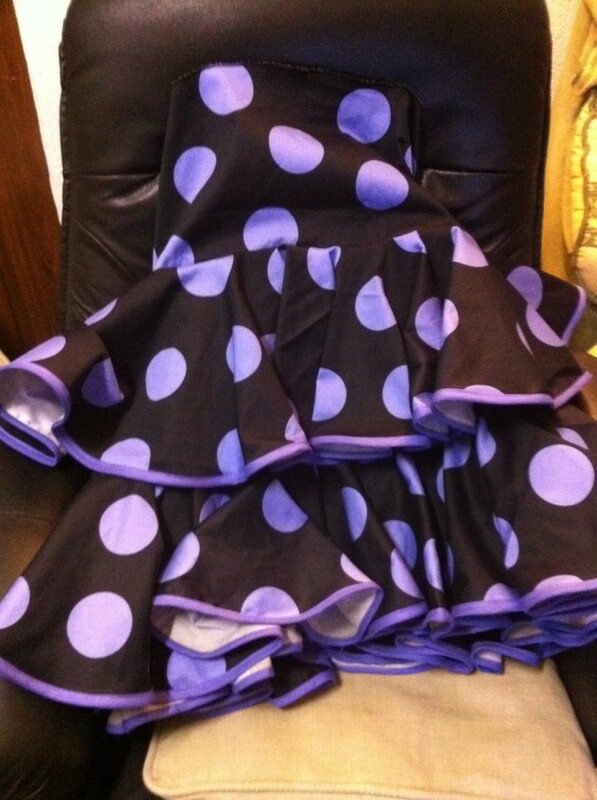 Also, a visual update on my Feria dress! (If you don’t understand why I was looking for salmon-colored trim, don’t ask, because I don’t understand either. I’ve forfeited my right to give input on the dress and I’m officially Just Going With It from this point on). I think my suegra has those slippers. So you’re saying your suegra is an incredibly stylish lady. She’d have to be, to have the bombona zapatillas. black, purple and salmon… i can dig it. I’m so cheap that I’m sticking with the mercadillo zapatillas. The smell seems to be getting progressively less worse. That, or my nose is adjusting.